When he was assassinated in 1896, Nasir al-Din Shah had occupied the Peacock throne for nearly half a century. A colorful, complex figure, he is frequently portrayed as indolent and indulgent. Yet he was in many ways an effective ruler who displayed remarkable resilience in the face of dilemmas and vulnerabilities shared by most monarchs of the Islamic world in the nineteenth century. 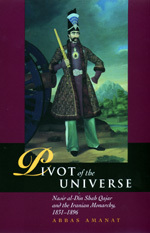 The Pivot of the Universe is the first biography of this fascinating monarch. In it Amanat traces Nasir al-Din Shah's transformation from an insecure crown prince, and later an erratic boy-king, to a ruler with substantial control over his government and foreign policy. He provides a vivid picture of the political culture that determined Nasir al-Din Shah's behavior and, ultimately, his conception of government: the mode of succession in an urbanizing nomadic dynasty, the complicated relationships of the harem and his family, and the fatherly role of his guardian-ministers. Based on extensive research into public and private papers, illustrated with drawings and photographs from the period, this book offers a fresh interpretation both of the significance of Nasir al-Din Shah and the way in which the Iranian monarchy, the centerpiece of an ancient political order, withstood and adjusted to the challenges of modern times. Abbas Amanat is Professor of History at Yale University. He is the author of Resurrection and Renewal: The Making of the Babi Movement in Iran, 1844-1850 (1989) and the editor of Crowning Anguish: Memoirs of a Persian Princess from the Harem to Modernity, 1884-1914 (1993).